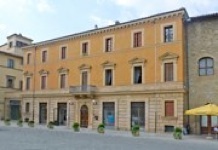 The Pinacoteca Civica was established in the Palazzo del Podestà (on the left above) in 1904. The first room of the gallery occupies the “grande sala” of the palace. The gallery now also extends into the first floor of the adjacent Palazzo Biancalana. 28 works of art were “stolen to order” from the gallery in 1987 and taken to Jamaica. They were recovered in 1990 and rehung in their original places. The renovated gallery re-opened in 1966. A surviving document records that the Priors commissioned a fresco of the Maestà with SS John, Crispoltus and Catherine for the Palazzo del Podestà. The fresco survives in situ on the entrance wall to the “Grande Sala” of the palace. The figure of St John (presumably St John the Evangelist) is largely lost. A fourth figure of St Antony Abbot was added to the documented commission. This altarpiece from Santa Maria Maggiore is attributed to the Sienese Benedetto di Bindo, who moved to Perugia and died there in 1419. The friars of San Crispolto bought this polychrome wooden figure of the Crucified Christ from San Francesco al Prato, Perugia in 1800, and installed it in the re-modelled Cappella del Crocifisso. The figure has moveable arms, and was probably originally used during Easter services, when it would have been removed from a cross and carried in procession. The figure has been associated with four panels of angels with instruments of the Passion, which came from a tabernacle in San Francesco al Prato and are now kept in the deposit of the Galleria Nazionale, Perugia. If this is correct, then all of these components came from a tabernacle that was financed by a bequest of 1470. This was designed to commemorate Angelo del Toscano, who had been the Minister General of the Franciscans from 1450 until his death in 1453. The sculpture has been attributed to Agostino di Duccio, who lived in Perugia in the period 1473-81. This double-sided processional banner was documented in 1863, when it was in the house of the archpriest of Santa Maria Maggiore. It was the subject of litigation between the archpriest Morbidello and the Commune in 1902, but eventually passed to the latter. It was restored in 1927-8. ✴the Pietà with the Virgin and St John the Evangelist on the other. This fresco was detached in 1901 from the wall to the left of the high altar of the Chiesa di San Crispolto. It depicts the standing SSt Michael weighing the souls of the dead while killing a dragon. It is attributed to Fiorenzo di Lorenzo or, more recently, to Bartolomeo Caporali. These two altarpieces from the Convento di Sant’ Antonio da Padova were moved to Santa Caterina when Sant’ Antonio da Padova was suppressed. ✴The altarpiece depicting St Antony of Padua is signed by Perugino. The inscription also records that it was commissioned by Bartolomeo di Maraglia, who was taken prisoner by the French at the the Battle of Marignano in 1512 (when in the pay of Gian Paolo Baglioni). Bartolomeo di Maraglia is depicted in armour kneeling at the feet of the saint giving thanks for his release. ✴Blessed Peter Negles on the right. These two frescoes, which are attributed to Tiberio d’ Assisi, were detached from the ruined church of San Simeone, Tor d’ Andrea (on the borders with Assisi) in the early 20th century. ✴In the Trinity, the seated God the Father holds a Crucifix, with the Holy Spirit in the form of a dove above it. A now-lost inscription of the date “1503” was recorded on it in the 19th century. Fra. Baldo, the Guardian of the Chiesa di San Crispolto, commissioned this altarpiece from Dono Doni. ✴The main panel depicts the Virgin, an elderly nurse and St Joseph together with three shepherds, kneeling in a semi-circle behind the baby Jesus, who lies on the floor of the stable in which He was born. ✴The predella contains scenes from the life and martyrdom of St Crispoltus. This altarpiece was documented on the high altar of the Convento di Sant’ Antonio da Padova in 1872. The panel is attributed to the workshop of Jacopo Siculo, who died in 1544. The main panel depicts the Madonna and Child in a mandorla of clouds and putti, with six kneeling figures below: SS Crispoltus; Francis; Jerome; (? ); Antony of Padua; and Louis of Toulouse. The predella contains images of the donors and identifying inscriptions: Donna Ciancia Angelini commissioned the work according to the will of her husband, Giuliano in 1547. This glazed terracotta standing figure is sometimes attributed to the della Robbia workshop, although it might be of local manufacture. It is of unknown provenance. This altarpiece was documented in the Cappella del Santissimo Sacramento of the Chiesa di San Crispolto in the 18th century. It depicts the immaculate Virgin with SS Crispoltus and Francis. It has been attributed to Cesare Maggeri, a close follower of Federico Barocci. 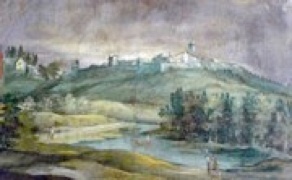 The lower part of the scene is set against a lovely townscape of Bettona, in which the San Crispolto is on the right the Convento di Sant’ Antonio da Padova is outside the walls, on the left. This altarpiece, which is of unknown provenance, is attributed to Antonio Maria Fabrizi. It depicts St Peter crying after having betrayed Christ. ✴the Madonna and Child with SS Mary Magdalene and Barbara, which is attributed to Benedetto Bandiera. Two half-length portraits in the gallery, which depict Malatesta IV Baglioni and Felice Ciatti, probably belonged to a series of images of famous citizens commissioned for the Palazzo del Podestà. ✴Malatesta IV Baglioni, Count of Bettona was a famous mercenary soldier until he betrayed the city of Florence in 1530 (when the Emperor Charles V re-installed the Medici there). He retired to Bettona and died in Palazzo Baglioni in 1531. ✴Felice Ciatti, who was born in Bettona in 1592, became Provincial Minister of the Franciscans. He was an eminent historian and one of the first to study the Etruscans, He died at Spello in 1642.